The remote control fob is cleverly designed to be hand-held, or to fit behind a standard wall switch. It communicates with a dedicated 140W LED PIR detector, which can be used with any of the LED Pro range of black or white floodlights. The detector simply replaces the terminal cover on the floodlight and plugs in, with no extra cabling required. 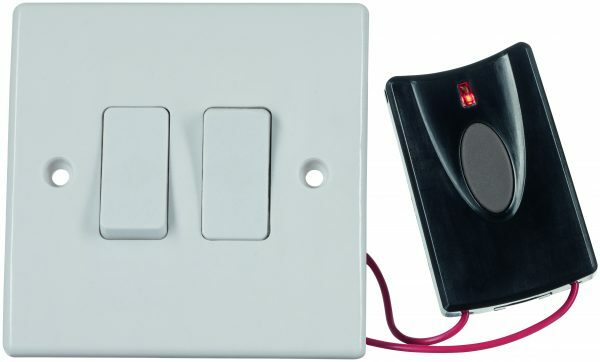 The fob can also be wired in to a standard wall switch, using cables that are supplied, enabling home owners to control the outdoor lighting using a wall switch but without having to do any extra wiring or redecorating. The remote control fob has a handheld range of up to 100m, and using it also eliminates the need for a hard-wired PIR override. Multiple fobs can be used, giving home owners control from several rooms. RF remote control is also available for Timeguard’s standalone SLB (Black) and SLW (white) PIR controllers.